Yesterday morning, got a big package from Beijing. It is a heavy one. 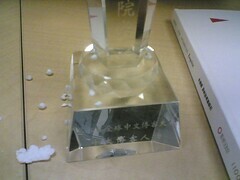 Inside the box, there is a glass plate to inform me I am chosen as the top 10 blogger by Bokee.com. Here is the news. Well. Let it be. Everyone organization is creating some noise as the top 10 blah-blah award in the blogging world. Since I get it, I accept it. That’s it. I appreciate the award in 2003, because of several reasons. 1. The selection is the joint effort of almost all players (BSP, insitute, media). 2. At that time, there are not so many commerical considerations from the organizer. Here are the top ten list. Of cause they are all very nice blog, but are they (or are we) the top 10? I seriously doubt it. Congratulations, Jianshuo! That’s a very nice trophy. Keep on blogging! Jianshuo, your Chinese blog deserves it. Funny: Keso’s blog isn’t nominated, not to mention Jianshuo’s English one. Definitely some of them (like the shunxxxx) should not be listed out. Let me ask you a quick question. Why I got many broken links at your site? Congras! Well, your English blog is much better and popular than Chinese one. If you dont have this English blog, I am not sure you will get this Top 10 Award. Thanks for the congrats. But it is not a big deal. I have no idea about the Award before I was notified of nomination, and don’t think it represent the real ranking. So just take is as an interesting stuff happening that day. That’s it. Checked other two of the top ten. It’s kind of humiliation to rank Jianshuo’s blog together with the others. I think Jiansuo’s is obviously at another level than the two I saw, much more elegant and inspiring. On the other hand, Jiansuo’s blog is there is at least evident that good taste still has a voice in blog ranking. Congratulations! It is at least not a bad thing. A blog that has articles such as “I need a USB cable” wins an award. What an excellent example of how awards mean nothing. hi!wwww.huntergold.com wow gold for sale! 1-70,get 1500G and Horse for 60 levels,buy 60-70 ,get 800G and Horse for 60 levels! If you need Powerleveling for other parergon,you should add 50 dollars for it !what are you waiting for ?Come here and enjoy our price quickly.why wait…go for it! If you buy 1000Golds and more ,you can get 10 percent bonus gold for free ,and if you buy 3000Golds,15 percent bonus gold for free will be given you,thank you!Power leveling 1-70 level present 1500G+Horse for 60 levels= 314.28EUR,Come to http://www.huntergold.com ! If you have any question,you can contact us at msn:huntergold99@hotmail.com or AIM:huntergold99. our company are in dire need of WOW eu account! Cheap wow gold,world of warcraft gold for sale!